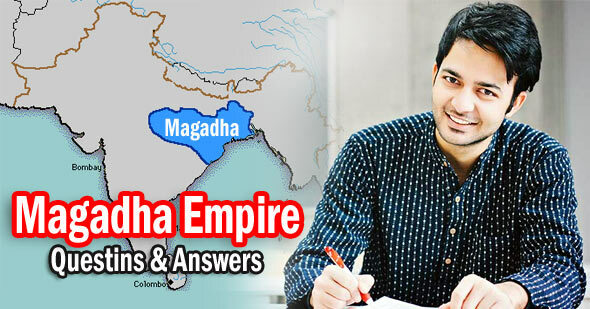 Magadha Empire Questions: The period from the 6th century BC to 4th century Bc saw the struggle for supremacy among four mahajanapadas-Magadha, Kosala, Vatsa and Avanti. Ultimately, Magadha emerged as the most powerful and prosperous kingdom in North India. The founder of Magadha was Jarasandha and Brihadratha. But the growth started under the Haryankas, expansion took place under the Sisunagas and Nandas and reached its aenith under the Mauryas. Extent former districts of Patna, Gaya and parts of Shahabad. 1. At the time of Chandragupta Morya who traveled in India? 6. Who was the founder of Haryanka dynasty? 7. Who was the last king of Nanda Dynasty? 12. Which book describes more about 16 Mahajanapada? 13. Which one is the capital of Avanti? 18. Which one is the technique used by Bimbisara to extend his empire? 19. Who was the last king of Shishunaga dynasty? 20. Which Purana explain more about Mauryan Empire?